"We all have a secret buried under lock and key in the attic of our soul. This is mine." His story begins in an old quarter of the city, where he meets the strange Marina and her father, Germán Blau, a portrait painter. Marina takes Oscar to a cemetery to watch a macabre ritual that occurs on the last Sunday of each month. At exactly ten o'clock in the morning, a coach pulled by black horses appears. From it descends a woman, her face shrouded be a black velvet cloak. Holding a single rose, she walks to a gravestone that bears no name, only a mysterious emblem of a black butterfly with open wings. 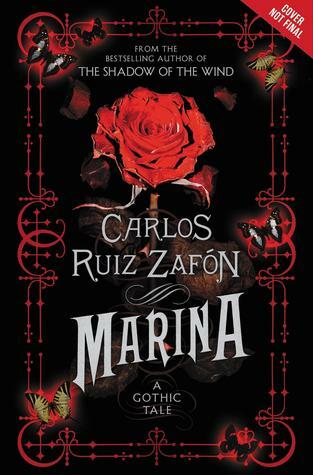 When Oscar and Marina decide to follow her, they begin a journey that transports them to a forgotten, postwar Barcelona--a world of aristocrats and actresses, inventors and tycoons--and reveals a dark secret that lies waiting in the mysterious labyrinth beneath the city streets. I have zero idea how to approach this. This has never happened to me before, so bare with me, okay? First and foremost, I didn't finish Marina. I had a really hard time getting involved in the story. At the same time, I don't feel that Marina is worthy of a DNF review or a poor rating. Weird, right? The writing is beyond wonderful and exceptionally descriptive. I can see getting lost in the pages and if you're a fan of Gothic literature, you'll definitely enjoy this novel. I don't want to turn you away from Marina. If the synopsis appeals to you, check it out from the library, download the preview chapters on your Kindle or Nook, or heck just buy it. There are amazing reviews on its Goodreads page. Maybe I just picked it up at the wrong time. This is a novel that you need to devout time to. You need to sit and completely engross yourself in the story of Oscar and Marina. I'm going to move this book to my "on hold" shelf on Goodreads, but a part of me wanted to bring attention to this novel. I think that alone should be a sign that, though I had trouble getting involved in the story, there is something about Marina that grabs hold of you and doesn't let go.